Easter is a big time for celebrating and feasting in Romania. But poverty prevents many families from joining in the festivities at this special time of the year. Georgiana, 15, lives with her family in Transylvania in one of the poorest Roma communities in the region. Her parents do not have jobs and are under constant financial pressure. Her father drinks a lot and is often abusive, and her mother is very distant towards her children. The image of a happy family gathering around a table at Easter to celebrate Christ’s resurrection seems unthinkable. Georgiana will never forget the day her mother gave birth to her baby sister and then abandoned her at the hospital. Thankfully, police officers brought the baby to the house and convinced her overwhelmed mother to keep her. Georgiana was so excited about her baby sister, she ran and told Paula Boruga, who heads up an After School club that Georgiana attends, run by Mission Without Borders (MWB). The club is like a second family to her – and Paula always looks out for Georgiana and her siblings. Georgiana is like a little mother to her sister Maria, often carrying her and taking good care of her. “She spoon-feeds her, changes her nappies and puts her to bed,” Paula said. Georgiana said, “I always leave my classroom last, because my classmates don’t take all the milk we receive from school. I take it home and give it to Maria. At Easter, she and her family are not forgotten. 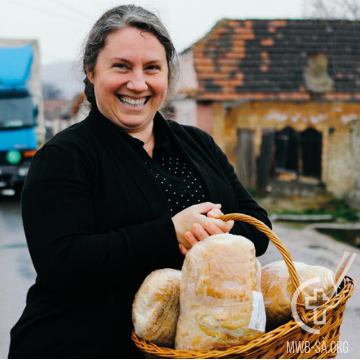 A MWB tradition in this community is to deliver loaves of bread at Easter to families living in poverty, along with literature explaining the significance of Jesus’ death and resurrection. The tradition points people to Jesus, the Bread of Life, and testifies of Jesus’ sacrifice for us – his body broken for us. Each loaf of bread is delivered with a Bible verse, “Jesus said to them, ‘I am the Bread of Life’” (John 6:35a). Your donation would enable us to give the gift of “food for the body and soul” to a family in need in Romania this Easter.